It’s rather bizarre to think that from 1976 to 2015, there were no operating whiskey distilleries in Dublin. It is, after all, a city steeped in the mythological properties of uisce beatha, the water of life. And it was once home to at least 37 different distilleries operating at once. But as happens in industrial nations, consolidation and the rise of mega-corporations has a tendency to thin out the herd, and Dublin eventually became a town bereft of its own distilled whiskey. That is, until Teeling set up shop and opened their distillery in 2015. This is not to say that Teeling, as a company, is simply relying upon whiskey they’ve distilled since 2015—it would be pretty damn tough to make it in this industry (or market yourself as a premium product) armed only with 1-4 year old spirits. These fellows had a trick up their sleeve. Jack and Stephen Teeling opened their distillery armed with 16,000 casks of aged whiskey from their father John Teeling’s Cooley Distillery, which he sold to them when the distillery was sold to Beam Suntory in 2011. The Cooley distillery has since gone on in producing entry-level Irish whiskey such as the ubiquitous Kilbeggan, while the Teeling sons have pursued a more epicurean path with the help of their dad’s aged stores. And in the process, they’ve helped reinvigorate the art of Irish whiskey distillation in Dublin. 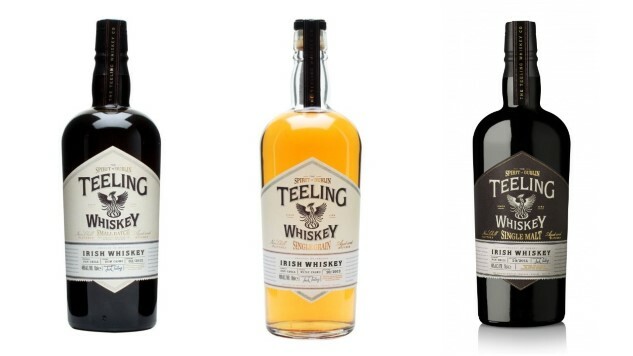 So then, in ample time for St. Patrick’s Day, let’s taste our way through the core of the Teeling lineup, the so-called “Trinity Range” of Teeling Small Batch, Teeling Single Grain and Teeling Single Malt. The flagship Teeling product is a non-age-statement (these all are, unsurprisingly) blended whiskey that is made with 50/50 grain and malt whiskeys, which apparently are “up to six years old.” They’re aged in the traditional manner, in former bourbon barrels, before being finished for six months in rum barrels, which adds a nicely distinctive character. The end product is still fairly young, but you wouldn’t really know it to taste it. Teeling Small Batch is bottled at 46 percent ABV (92 proof), with no chill filtration. On the nose, I immediately find this very sweet and inviting. “Bright” is the word—light (in color) and intense honey notes, chased by lemon/orange citrus zest, fresh green grass (I’m reminded of the “heather” always referenced in Irish/scotch whiskey reviews) and juicy apricot. The rum barrels seem to have amplified the stone fruit qualities here, and kicked up the vanillans a bit, both of which are lovely. It should be noted that there’s a decent amount of booziness on the nose, but I’m able to look past it because of the proof and the assertiveness of the other notes. On the palate, I likewise find this delightful. Quite sweet once again, with a combo of clover honey, biscuit and stone fruitiness, it’s a very approachable Irish whiskey except for the moderately bracing strength of the alcohol. Sometimes I’d cite this as a negative, but here it actually works for my taste—it feels like a bombastic, cheerful whiskey rather than a contemplative sipper. The initial rush of heat announces that this small batch isn’t playing around, and gives way to a long-lasting profile of lighter stone fruit (apricot) and some darker notes (plummy) as well. All in all, Teeling Small Batch is a tad on the aggressive side, but I found myself oddly charmed by it. I can recognize that, for example, the Single Malt is the more refined of the two, but the flavor palette of Small Batch is very much up my alley—enough so that it actually might well be my favorite of the Trinity, and at a decent price! Not that I’m complaining. “Single grain” Irish whiskeys seem to be on the rise, although I haven’t quite come across one that has yet sold me on the concept. Like single malts, the name designates that all the spirit comes from the same distillery, and is something other than barley—in this case, corn. Teeling Single Grain, then, is a corn-heavy Irish whiskey that has some aspects in common with American bourbon, but the added wrinkle of being aged in Napa Valley Cabernet Sauvignon barrels. Like the others, it’s bottled at 46 percent ABV (92 proof), with no chill filtration. This whiskey strikes me as more muted on the nose than the previous Small Batch. It’s softer in terms of assertiveness but deeper in terms of caramelization. Less bright and a bit more rich, you get a bit more toasted oak and a distinct cocoa note that stands out very clearly on the nose. Each time I returned to this one, the cocoa on the nose only seemed to get stronger. On the palate, this one begins as bourbon-esque, with a corny, grainy sweetness, supported by caramel, cocoa and vanilla. The red fruit that you’d expect from the wine barrels is a bit harder to place, not coming through as a starring character. Instead, this one seems more strongly overtaken by the booziness, which works less well here than it did in the Small Batch—this might have benefited from a slightly lower proof, perhaps. Overall, notes such as the cocoa influence and toasted oak are interesting, but I’m still not sold on Irish single grains as an emergent style. Teeling Single Malt is a real melange of many different ages (up to 23 years old, apparently) and cask finishes. As the company puts it, “combined within this multi-layered liquid is the influence of five wine casks, including Port, Sherry, Madeira, White Burgundy and Cabernet Sauvignon.” Like the others, it also weighs in at 46 percent ABV (92 proof), with no chill filtration. It’s immediately obvious on the nose that the finishing barrels are going to be a lot more expressive on this single malt than in either the Small Batch or Single Grain. It’s much less bright and much more rich, vinous and winey, suggesting a ton of fruit character. There’s a treacly sweetness to the nose, and all sorts of red/dried fruitiness that makes it seem very port-like indeed, although the note that I found myself returning to again after it sat for a while was actually pears. I wasn’t quite expecting that. On the palate, this one is a viscous, slightly syrupy dram. Quite sweet and fruity, it successfully tamps down and mellows out the alcohol character that is more intense in the Small Batch (pleasantly) and Single Grain (less so). The fruitiness is decadent, with layers of currant, raisin and perhaps strawberry, which combine with the sweetness to give this some definite dessert wine qualities. An after-dinner whiskey for certain, but not overwhelmingly sweet or rich, this one will definitely appeal to those who enjoy whiskey with a lot of dark fruit presence. For myself, I think it makes for an excellent nightcap, but my heart goes to the Small Batch by the smallest of margins.